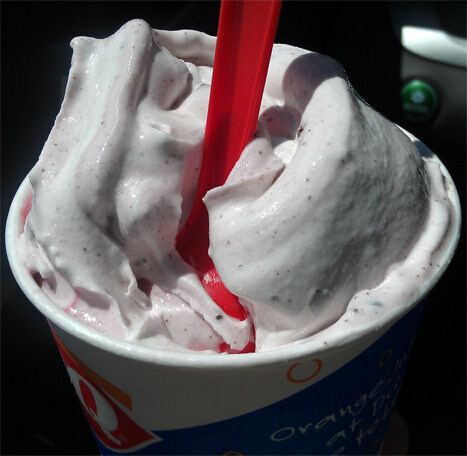 The DQ Tripleberry Brownie Blizzard! Strawberry, raspberry and blackberry puree, chewy brownie pieces and choco chunks. Oh man I can't wait to try this new treat. I love strawberry blizzards, so I hope they use equally tasty raspberry and blackberry purees to knock this one out of the park... or it'll be one and done... fingers crossed. Let's go find out! Tada! Shocking, the new blizzard isn't even remotely as dark as the promo photos they released (it's August 4th and dq.com still isn't updated). Anyway, seeing this, I'm already afraid. 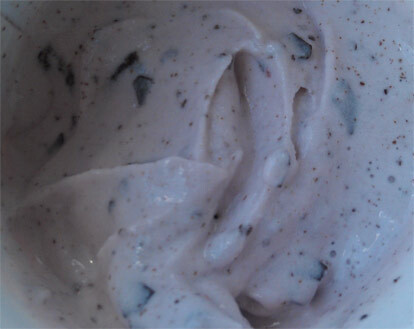 More color would imply more flavor, plus there's no brownie bits in site, though there are some crumbs speckled about. Wait, reality check. You can probably already tell this is going to be a negative review, can't you? 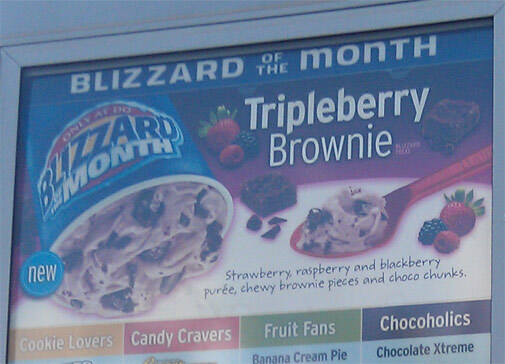 My wife and I both got the new tripleberry blizzard and both of us got stale brownies mixed in. That totally knocked this one down a few pegs. Also, this was more mild raspberry flavoring than anything. I had one neat bite that had a bit of strawberry kick to it, but the other bites were just ho-hum. It looks pretty cool in this last photo with the chocolate chips and the brownie crumbs, but it just didn't deliver what I wanted. It was just a mild, kinda-raspberry, dry brownie bite cup of coldness. My daughter chimes in the back "you should have gotten this Oreo blizzard, it's always great". Ahhhh, children... I had to explain that I can't discover great new blizzards if I'm unwilling to try them. Sometimes the blizzard of the month works... and sometimes it's best that it's only available for a limited time. As always, your personal results will vary greatly. This is one experience at one DQ (at least it's better then the lemon meringue pie blizzard). Don't forget that Thursday, August 8th is Miracle Treat Day, so at least $1 from every blizzard goes to charity. If you aren't sure about this new blizzard, the S'mores blizzard is still available!